Hatters caretaker boss Andy Awford is relishing the chance to lead Luton Town against his former side Portsmouth this afternoon. The 43-year-old spent over a decade as a player at Fratton Park before being appointed to the backroom staff and was in charge of Pompey last season when they beat Hatters 2-0, parting company in April. However, after being asked to take temporary control of Town until a new manager is appointed, he said: “It would be easy for me to stand here and say it’s just another game, it’s not for me, of course it’s not. “You don’t spend that long at a club like I did and it just be a normal game of course it’s not. With Portsmouth being a Premier League club only five years ago, Awford is well aware of the level of expectancy amongst both sets of supporters. He continued: “I was manager at another big club, Luton’s a big club too, possibly arguably the biggest clubs in the league. “Expectation level is the thing that you’re always as a manager trying to keep on top of, but nobody has a divine right because of their history to just get promoted, it’s very, very hard work. 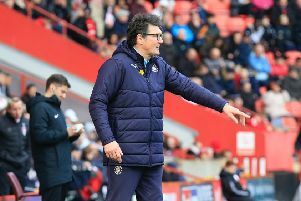 “I think both clubs suffered very quick decline, what happened with Portsmouth and now what happened with us here at Luton. “It takes a bit of time to recover from that, and it’s very difficult to just snap your fingers and get promoted.